Here’s an easy recipe for choriqueso empanadas, these mouthwatering empanadas or stuffed savory turnovers are filled with chorizo and cheese, and can be fried or baked. Choriqueso, also known as queso fundido con chorizo, is a warm dip made with chorizo and cheese; it is usually eaten with tortilla chips or as a filling for corn tortillas. 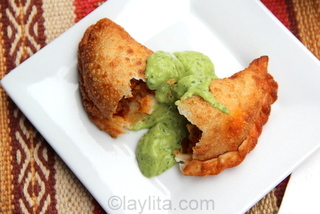 Choriqueso is one of my favorite Mexican appetizers, so the idea to turn it into an empanada was a no-brainer. 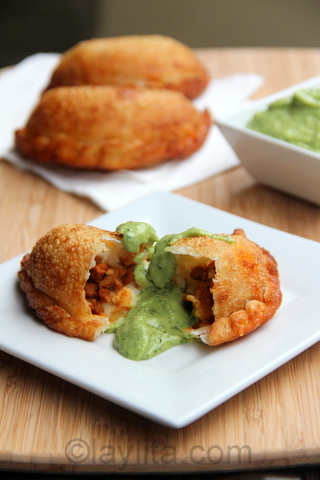 What a better way to stuff all that cheesy and chorizo goodness into a few bites than by putting into an empanada? Sometimes you have what you think is a great idea for a recipe and it turns out as you expected, a few times it turns out horrible and you wonder what the crap you were thinking. Then there are some occasions when it’s actually better than you imagined, this is exactly what happened with these chorizo cheese empanadas. 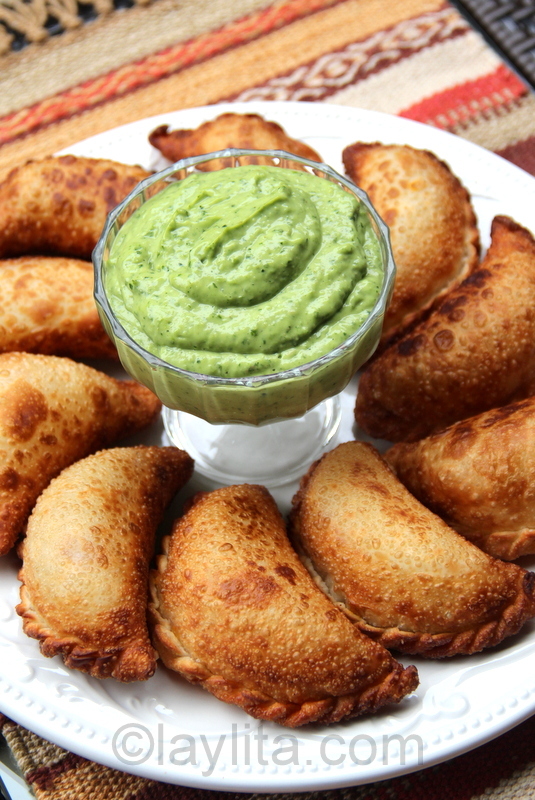 It’s not just the empanadas themselves but the combination of the empanadas with the avocado sauce. 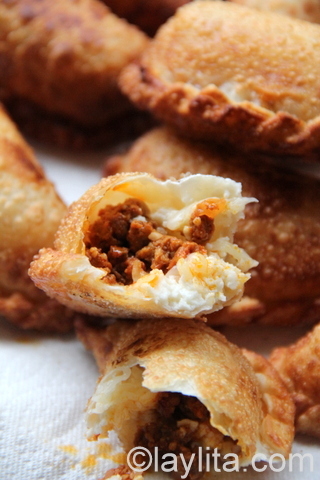 Mouthwatering empanadas filled with chorizo and cheese, can be fried or baked. Served with a creamy avocado sauce. Heat the butter or oil in a frying pan over medium low heat, add the diced onions and cook until they are soft and translucent, about 5 minutes. 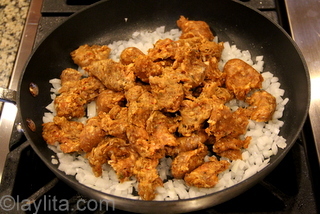 Remove the chorizo from the casings, break it up in chunks and add it to the onions. 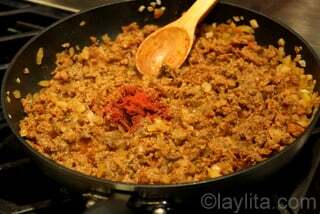 Cook the chorizo meat on medium heat until it is fully cooked; stir frequently to help break up the pieces of chorizo. Add additional achiote powder if desired. Let the chorizo cool down completely before using. Mix the grated mozzarella with the crumbled queso fresco. 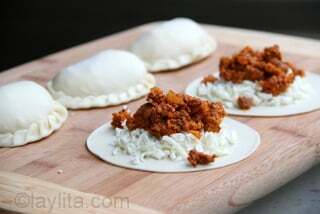 To assemble the empanadas add a spoonful of the cheese mix topped with a spoonful of the chorizo on to the center of each empanada disc. For extra heat you can add slices of fresh jalapeños. 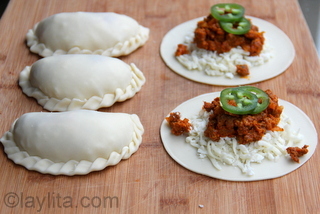 Fold the empanada discs and gently seal the edges with your fingers. 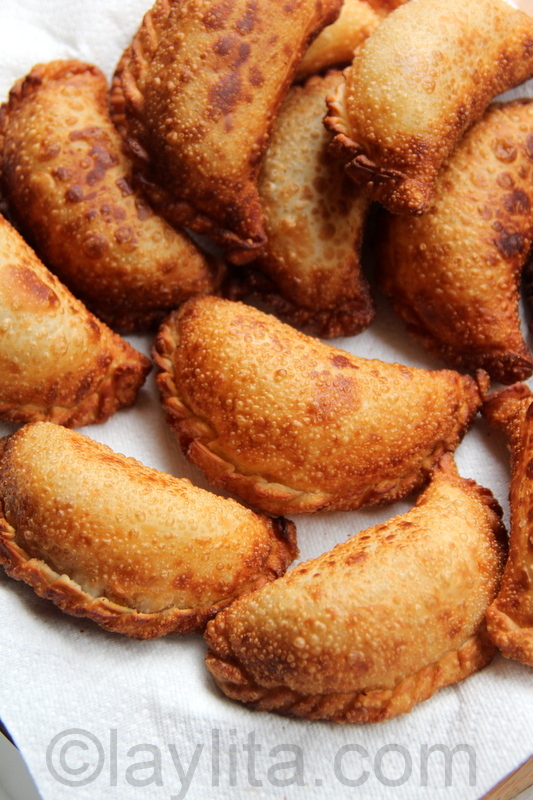 Twist and fold the edges of the empanadas with your fingers. For extra sealing you can use a fork to press down on the edges. Chill the empanadas for at least an hour, this will help them seal better and prevent leaks. This is especially needed if you are baking the empanadas. If baking the empanadas pre-heat the oven to 400 F. Also, brush the empanadas with egg wash right before baking to give them a nice golden glow. Bake the empanadas for 20-25 minutes or until golden. Fry the empanadas in a deep fryer or in a frying pan, if using a frying pan, make sure to add enough oil to cover at least half of the empanada. 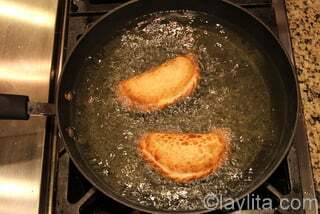 Let the oil get very hot and fry each empanada until they are golden on each side, about a minute per side. Place the empanadas on paper towels to drain any excess grease and serve immediately. 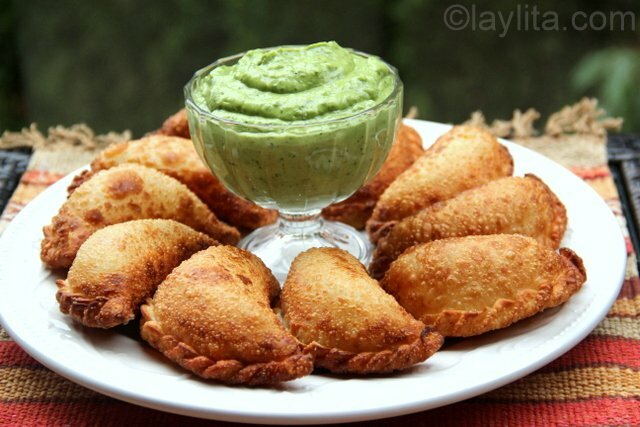 Serve the empanadas with avocado sauce. 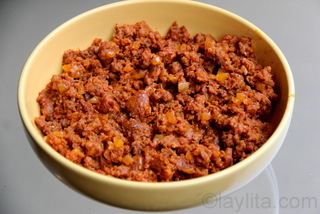 Chorizo is made with ground meat and spices; it can be made with pork and/or beef, though pork is more common. Spanish chorizo is dry cured and ready to eat when you buy it, while Mexican style chorizo is raw and must be cooked fully before eaten. Each Latin country has their own version of chorizo, the spices and condiments that are added make it unique to each place. For example, in Ecuador we don’t use spicy peppers in the chorizo, we add spices like cumin and achiote, but they are very mild. You can find chorizo at most supermarkets in the US; some even sell their own chorizo mix. At Pike’s Place Market in Seattle there is a shop called Uli’s that makes all kind of sausages, including a really good chorizo. I used to shop there more frequently when I worked in downtown Seattle and just happened to go to the market with a friend last week, so I used their chorizo for this recipe. I noticed that many of the freshly made chorizos, Uli’s included, don’t add enough achiote, so I added additional achiote when cooking the chorizo so that it gets that nice bright red color. 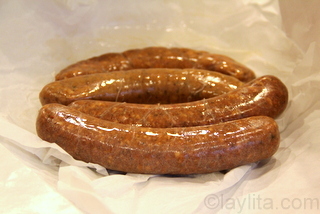 Uwajimaya, a local Asian specialty grocery store, also sells a really good chorizo made with both pork and beef called Taylor’s Sausage (made in Oregon) that is packed with flavor. I used a mix of mozzarella and queso fresco cheese for these empanadas, you can also use Oaxaca cheese as it melts very well or Monterrey Jack. Queso fresco isn’t great for melting, but adds more flavor to the filling. 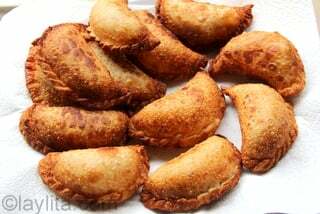 I fried these empanadas and they were sinfully delicious, but you can also bake them for less fatty alternative. I didn’t have any problem with the filling leaking out while frying them, but for baking I recommend making sure they are well sealed and chilled before baking to avoid any leaks. You can either make the empanada dough yourself or use the empanada discs that are sold in the frozen section of most Latin grocery stores. Dipping sauces are a must have for serving empanadas. For these I made an avocado sauce, sort of a creamier more liquid version of guacamole, which worked out really well. When I told my husband that I was posting a new empanada recipe he said “Oh, don’t you already have a ton of empanada recipes?”…There is no such thing as enough empanada recipes, the wonderful thing about empanadas is that as long as you can think of a new empanada filling the possibilities are endless. The kids’ reaction was better; they loved the idea – since they love chorizo and cheese – and devoured them. 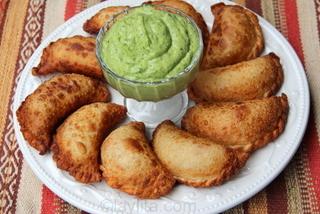 Alex (10) likes to open them from one end and then stuff them with the avocado sauce – I got the highest review ever from them for these empanadas. que fotos tan lindas! la verdad es que se me antojaron muchisimo. Gracias Laylita! Do you prefer to fry or bake the empanadas? I grew up with fried, but have tried to bake them to make them a little healthier. They don’t have the same crispiness, though – would the egg wash help with that? I love them fried! Especially when they have cheese inside, but I do tend to make baked empanadas more often than fried ones, and will save the fried ones for one I really want to indulge (or have one of those huge cravings that won’t go away – and just replying to this message has made me crave fried empanadas!). Que ricas se ven! Necesito probarlas pronto. Gracias! 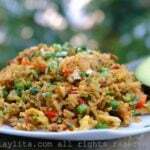 Looks delicious and looking forward to making it this weekend. 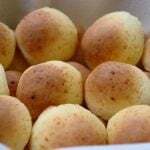 Where can I find the empanada discs? I live in Seattle as well but having a hard time finding the discs. I would make my own dough but dough and I don’t mix well together. Dios mio, que ganas tengo de correr a mi casa ahorita y hacer estas empanadas. Gracias por la receta!